You should know 68000 already, If you don't please go through the Basic 68000 Assembly Lessons first! Enough talk, let's start creating code, and put those 68000 machines to work! The x68000 has a built in dedicated graphics card, it's memory is accessed through the normal addressable range, but there are some quirks! In this lesson we'll learn how to set up the graphics screen, print text from a 1bpp font, and draw a bitmap to the screen! 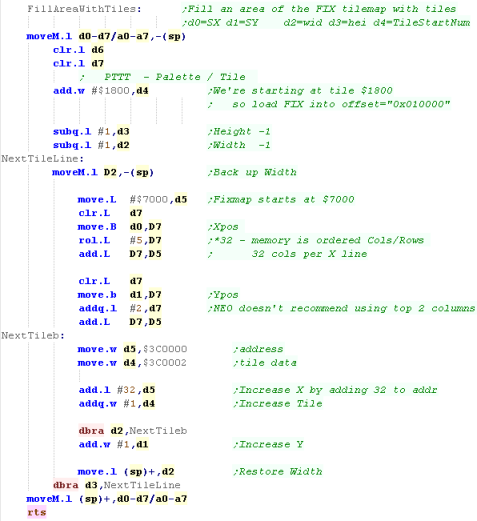 To set up the screen we want need to write the correct byte data to the memory mapped registers - a chart of the correct working values is shown below, and you probably don't want to alter these if they work for you! We need to set up the CRT parameters which will define how the screen image is formed - we also need to define the registers which will configure the screen layout. Note: we're not doing anything with the sprite registers at this time - at the time of writing, hardware sprites are not used in these tutorials, though theyy may be added later! In these tutorials we're only going to use one 16 color layer - the reason for this is that we're going to do the same on a wide variety of 68000 systems (and even the same tasks on z80 and 6502 systems) and the vast majority of these systems support 16 color, but few support 256 colors. We need to use GetNextLine to move down after each complete line. This Vsync routine was used in Grime 68000 to slow down the game, but it's not perfect, on a 100mhz x68 it's much faster than a 1st gen machine... but this is the best the author has managed to do so far! 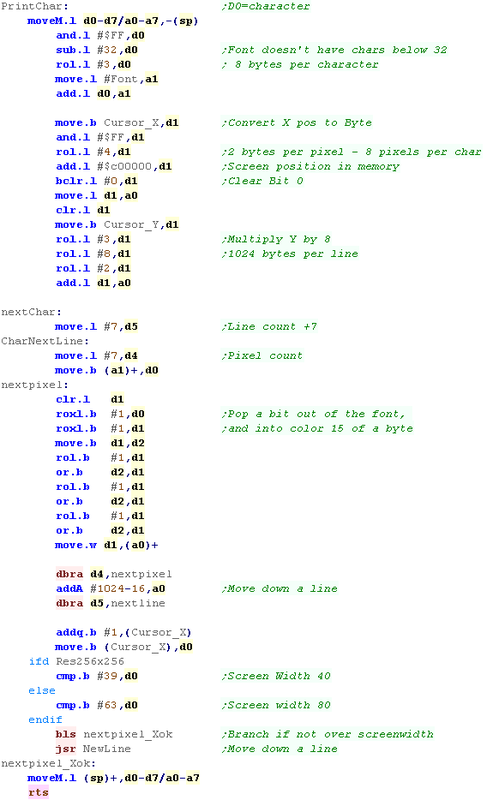 When it comes to actually plotting to the screen, we're popping of a bit of the font lines, and moving it to 'color 15' of the byte, before drawing it to the screen. Once we've drawn the character to the screen, we increase the X position - and see if we've reached the width of the screen, if we have then we run the NewLine command to wrap to the next line. 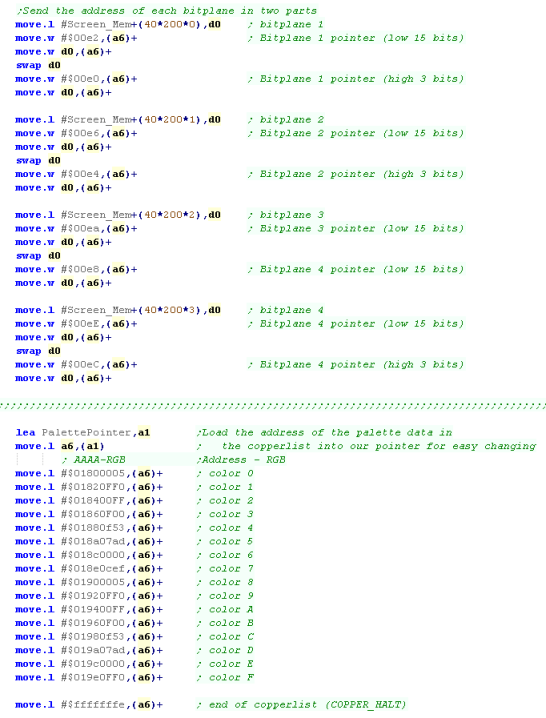 You'll need to define Cursor_X and Cursor_Y in ram somewhere... also not there's some simple LOCATE and CLS commands not shown here, download the sources.z7 if you want to see them! 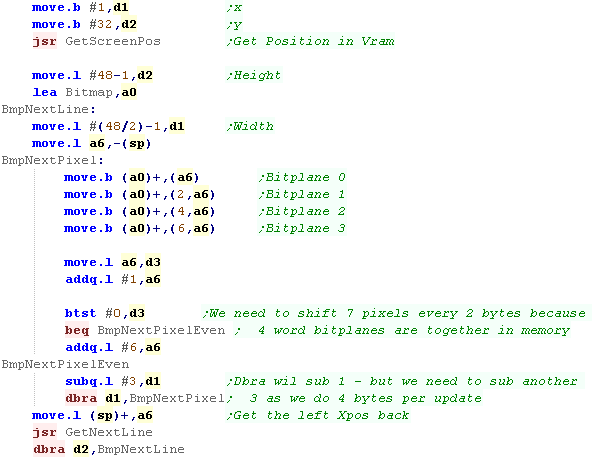 The layout is a bit odd - it's split into bitplaines in 16 pixel Words... lets see what that means! 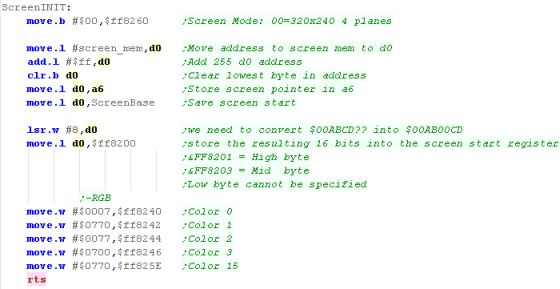 These colors are stored in 'Bitplanes' - this means each byte defines one of the color bits for 8 pixels. 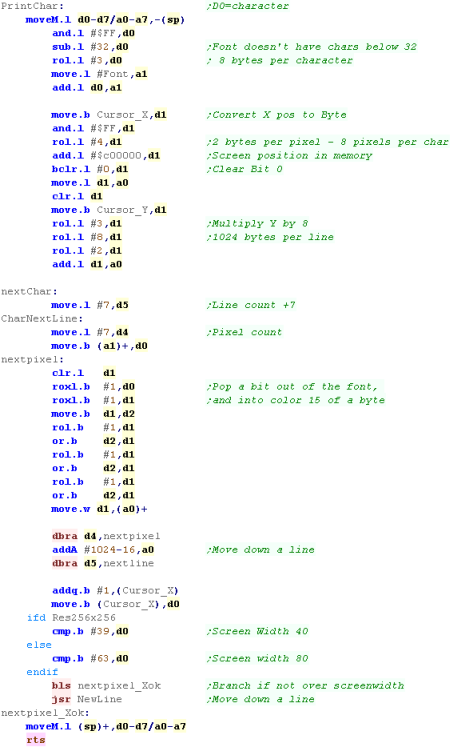 The screen is 320 pixels wide, so each line is 160 bytes across... and Line 1 is 160 bytes after Line 0 in the memory. These registers are defined from $FF8200-$FF8260.... 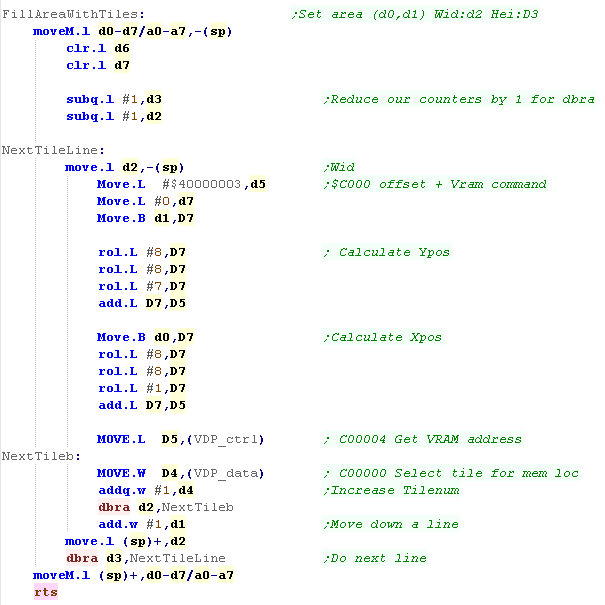 Note that because the 68000 uses a 24 bit address bus, the byte is usused - you may see in some documentation addresses like $FF8200 shown as $FFFF8200... these are the same address. We can also set colors with addresses $FF8240-$FF825F - one word defines each color. Because we need the bottom byte of the screen start to zero, we're going to allocate 256 bytes more than we need. If we want to move down a line, we can just add 160 to our current position to do it. We can use function $25 of Trap 14 (Xbios) to wait for the vblank. Alternatively we can use the Vblank counter at address $462 - this is a counter that's updated by the firmware every time vblank occurs. 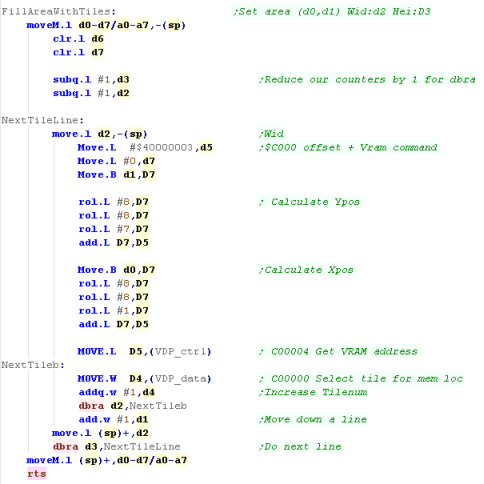 Ideally, we'd rather go direct to the hardware and detect VBLANK rather than using the firmware, but the author of these tutorials is too stupid to figure it out!... if you know how, please give him a clue - and tell him how it works! Finally we'll move another 7 bytes... this will move to the start of the next word... and we'll repeat the procedure again! We could use Atari ST native format, but there are advantages to storing the data byte aligned, and converting it to word alignment. The reason we're doing this is it allow us to write to any byte aligned X position - whereas if we used native Atari ST screen foramt we'd have to be word aligned. However the NeoGeo does have an 8x8 FIX layer - which is deigned for onscreen text and other such stuff - and to get us started, we can use it to do our Chibiko Bitmap! But the NeoGeo HAS NO TILEMAP! So how does the NeoGeo work with no Tilemap? Well... sprites on the NeoGeo are 16 pixels wide, and can be up to 512 pixels tall - but they can be combined!... and because the NeoGeo is capable of a whopping 380 tiles, we can combine 20 of them together to 'simulate' a tilemap!... this is how background graphics are drawn on the Neogeo! 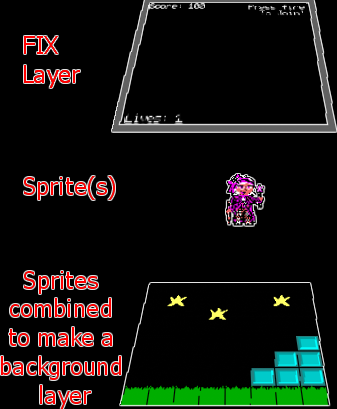 Sprites are 16x16 - but the NeoGeo has Hardware scaling, so we could scale them down to 8x8 - We'll learn all about Sprites in a later lesson! Mysteries of The Fix Layer! Fix Layer tiles are in an odd format! The 8 bytes of each column are in normal top->bottom format... so at least that:s something! The FIX and SPRITE formats are different on the NeoGeo which is VERY ANNOYING! You can use AkuSprite Editor to create valid files - and remember, it's open source, so if it doesn't do the job well enough, you can use the source to make something better! 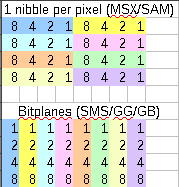 RawNEO.FIX - this is the bitmap data we're going to use today to show 'Chibiko' onscreen! 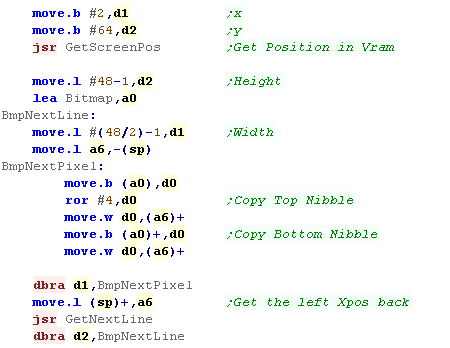 We'll set the correct positions of the fix tilemap to the parts of the bitmap. We repeat the procedure for each of the tiles we want to draw to the screen. 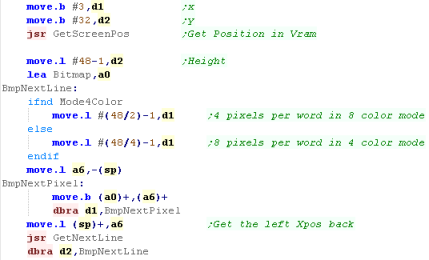 Lines are in a linear format, with each line 128 bytes below the last... two concecutive bytes make up 4 pixels in 8 color, or 8 pixels in 4 color mode. There is no palette - the colors are fixed... it is not possible to have 'brightness levels' - colors are on or off. My AkuSprite Editor can export 4 or 8 color bitmaps, however it does not support Flashing mode. Flashing only works in 8 color mode -it's a HARDWARE flash, and does not use th interrupts or firmware. When a Flashing bit 1 is set - all subsequent pixels will flash between their normal defined color and the color of the pixel with the flashing bit set. That said, Falshing mode is pretty dumb anyway, so you're not missing anything important if your emulator doesn't support it! 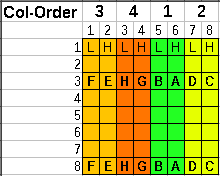 a 1 will set 8 color mode... a 0 will ser 4 color mode! When we want to calculate the memory location of an X,Y position, it's pretty easy. Each 8 pixels uses 2 bytes, so we bit shift the X pos in D1 by one bit. 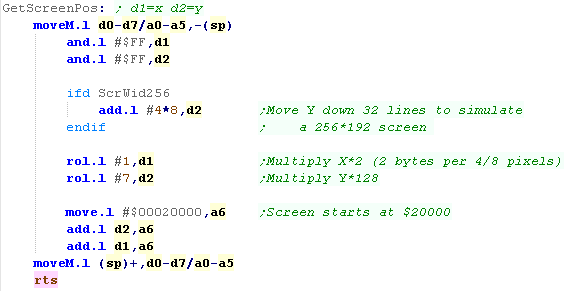 Each line uses 128 bytes, so we bit shift the Y pos in D2 by 7 bits. Then we add $200000 - the offset to the start ofthe screen. Because 4 color mode has twice as many pixels per byte, we need to alter our line total in D1 depending on if we're in 4 color mode or not. The Sinclair QL's screen is pretty limited for a 16 bit machine, but remember... it's an 68008 - which has an 8-bit data bus, so technically it's and 8 bit machine... this means it's much slower than an Amiga or similar... and you'll have to optimize yout code more to keep the games fast. The reduced graphics were probably and unavoidable sacrifice considering the price-point and early release of the machine. 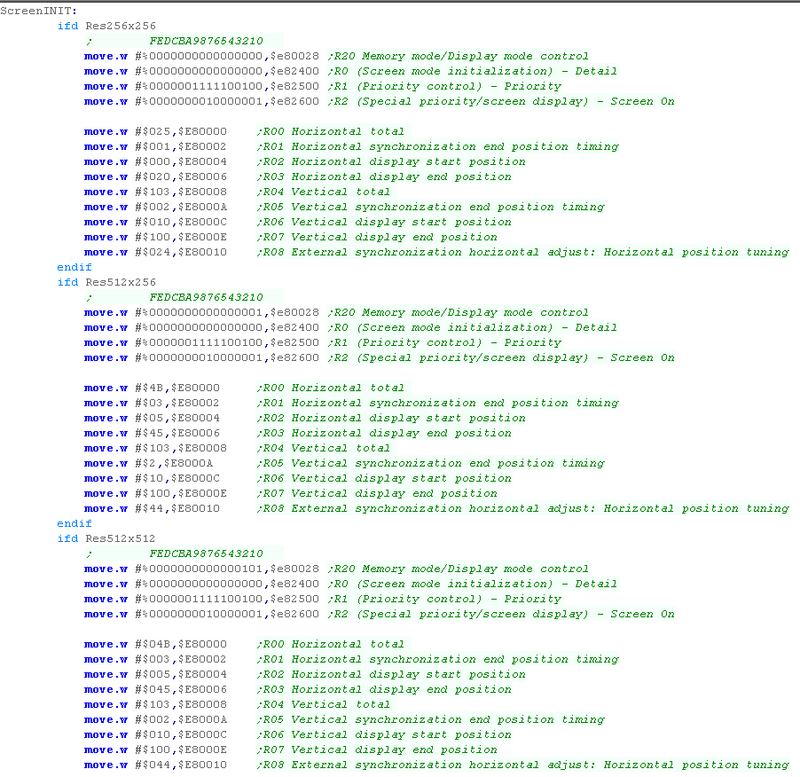 Therefore, in effect we can write 255 to port $18021, then read from $18021 until it's nonzero to get the Vsync event. 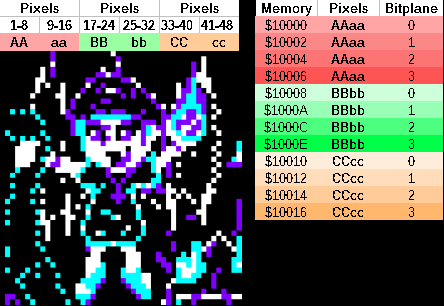 Basically, each color in the palette has two bytes defining it's RGB value, but we're not going to go into more detail at this stage, as we'll be covering it in more detail later. We've now done the basics... so we'll start the screen display, then convert our 2 bit font to tiles in the tile definitions. 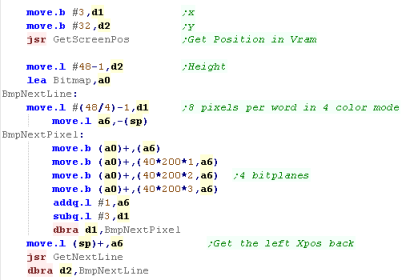 Setting Reg 16 to 01 defines a tilemap of 64x32 - we could define one that's 32x32 or 64x64, but as our visible screen is 40x28 so 64x32 seems a good choice! 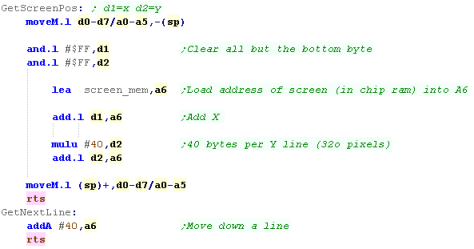 If you change it, or the memory address of Scroll A, then you're going to have to change the rest of the code in todays example! We'll need to select addresses from $0000-$C000 to define our tiles and each tile takes 32 bytes. 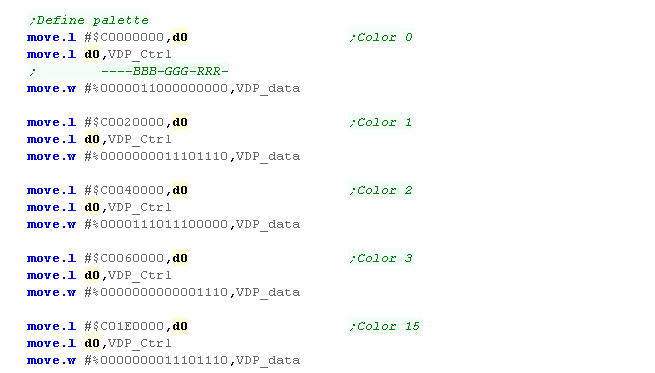 you can see some how various sample VDP addresses convert to address select commands in the table to the right. Selecting VDP memory is really confusing... but don't worry, we're going to create a little function that will do all the work for us! The reason it's so confusing is the Genesis was designed to be backwards compatible with the Master system... that's why the genesis uses a Z80 for it's sound chip - it can be used as the main CPU for SMS support! When we want to transfer our tile definitions to VRAM, we can just call this 'Define Tiles' command. 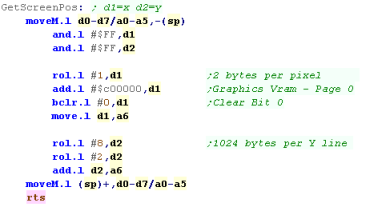 Of course, you'll need to convert a bitmap into the correct format for the VDP... but you can do this with my AkuSprite editor! AkuSprite editor supports all the systems covered by these tutorials... and It'll be extended to cover any systems added in the future. To show our bitmap on the screen we need to set the tiles in the positions we want to the correct pattern numbers for our bitmap! 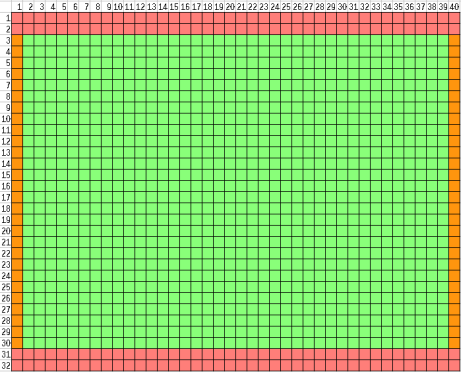 The command will calculate and set the tiles to get our bitmap onscreen! We continue this procedure until the the bitmap is drawn to the screen! Of course this is just a simple example... but you can use it to create something better... Take a look at Grime 68000 if you want to see a more advanced example! 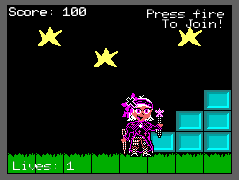 We've only looked at Tiles so far, but don't worry, we'll look at sprites later! 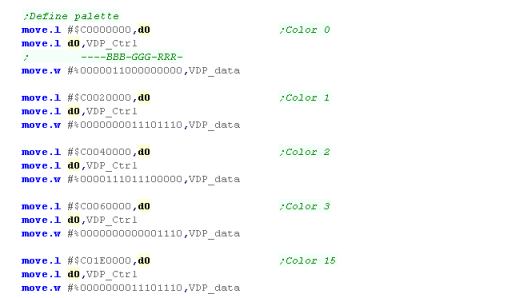 We can detect Vblank using bit 3 of data read from the Control port, we just read in a byte and test it, if the bit is 1 we're in VBlank. We can wait until Vblank starts, and ends to ensure our game isn't running faster than 50fps. However there are some complexities to getting things working, so lets learn how to make it behave! The Amiga screen is essentially a bit-planed bitmap within 'Chip Ram' (the built in memory of the Amiga - not upgrade memory)... we can write bytes to this ram, and they will immediately appear on the screen - but first we need to set the screen up! 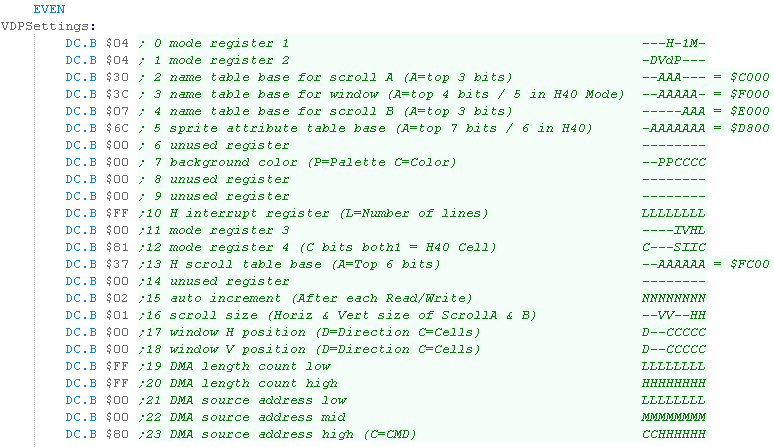 We give this a set of commands defining the screens location and shape in ram! In these tutorials we'll be defining one 320x200 layer of 16 colors (4 bitplanes)... this is because it will give good 'compatibility' with the Atari ST, and the other systems we're covering in these tutorials. Now we have some memory, we can start setting up the screen! we'll use this to turn on the screen, but we'll do all the other screen config by directly manipulating the hardware registers! We're going do the basics of defining the screen size, bitplanes and position. we're now going to set up our copperlist that will define the screen memory and colors! We need to define our copperlist, the Coprocessor will use it to draw each frame of our screen. 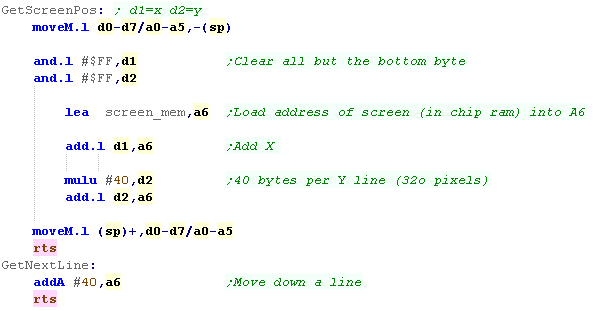 The second word (2 bytes) is the new value for the command. Then we'll define our starting color palette... we'll also remember the memory position of the palette definitions, as we can use it later to change our colors. The last commands is a command to wait forever ($fffffffe) ... the list will automatically restart when the next screen redraw starts. When we've defined our copperlist, we load the address of the copperlist into the pointer of the Chip Ram - our screen is finally set up! The example here is just creating a single plane, you could have more colors, or more planes with a more advanced set up, but that's beyond the scope of these tutorials - but feel free to play around if you want! Our screen is split into 4 bitplanes, and as the screen is 320 pixels wide (40 bytes) and the screen is 200 lines tall, then each bitplane will be 8000 pixels apart. 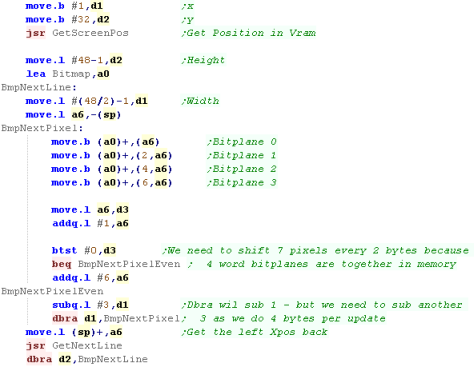 4 consecutive bytes bytes are copied to each bitplane. The bitmap will be shown to the screen at the position we specified! 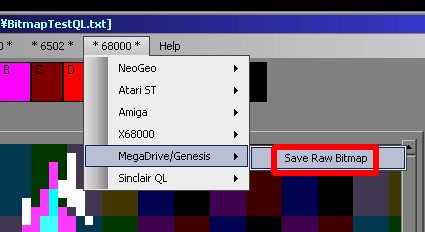 Want to convert a bitmap for use on the Amiga? The Free & open source AkuSprite Editor can do it for you! It's included in the sources.7z, so go get it if you want! Setting up the screen was hard, but Calculating a screen position is easy.. all we need to do is multiply our Ypos by 40 (the width of the screen) and add X , and the base of the screen. Moving down a line is also easy, we just add 40 to the current position! Of course, calling a routine to move down a line is a pretty lousy to do things if you're just doing an Amiga game, you should just put that ADDA straight in the loop! The reason we do the call is we're supporting lots of machines with the common drawing code... THEN it makes sense!